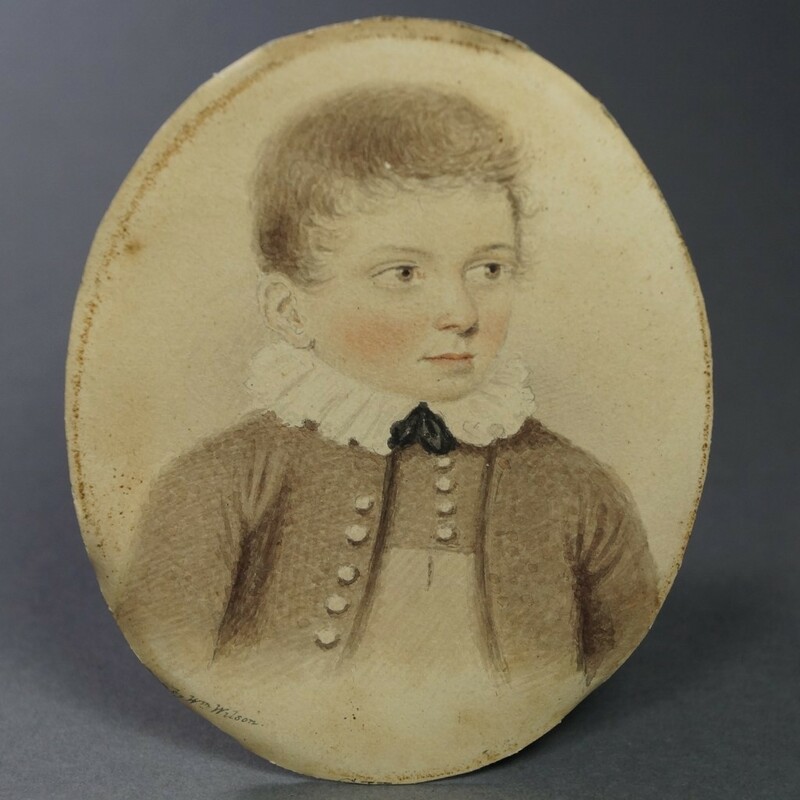 This charming Regency portrait miniature of a sweet, brown eyed boy was produced in England in January 1822. 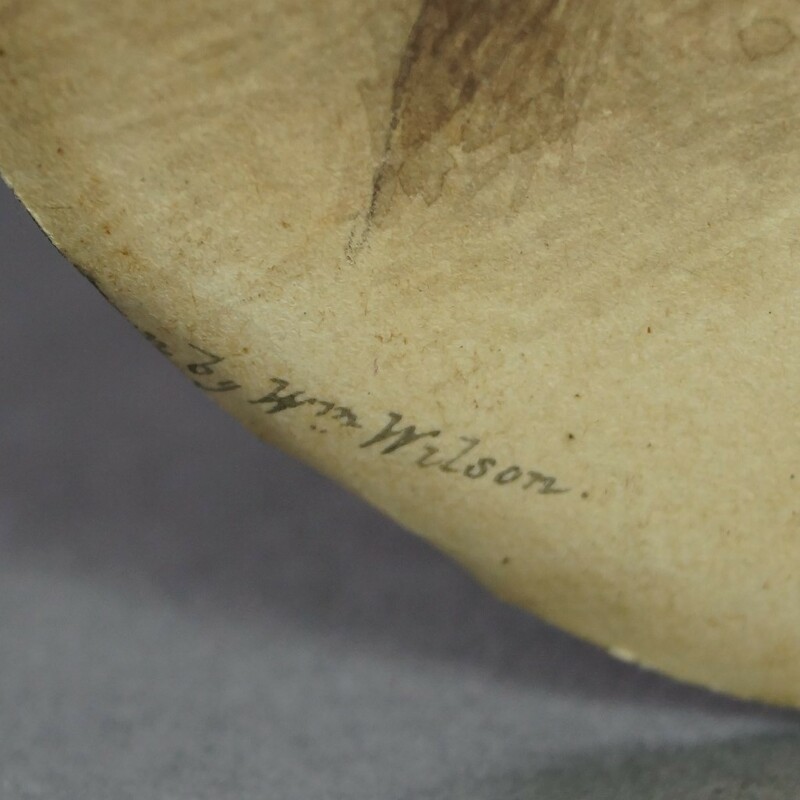 The watercolor portrait was painted by the artist William Wilson see signature bottom left. The young male sitter is named as John Gilchrist to the reverse. 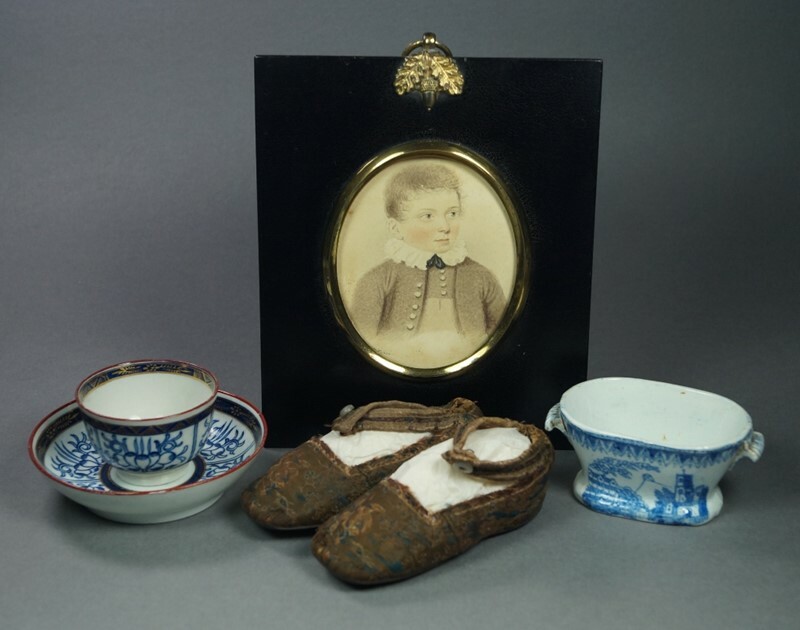 The sitter is likely between 7 – 10 years old at the time of the painting as this was the age that young boys would wear a very short jacket over their buttoned skeleton suit with frilled shirt collar poking over the top. He has such a wistful look and we adore his fashionable swept forward hair. This all original painting is neatly signed by the artist bottom left reading ‘Wm Wilson’ and is signed and dated verso. The watercolor painting is on card and is housed behind flat glass in a period correct papier mache frame. The frame features the impressed crown stamp for William Hill and Co, Birmingham. William Hill was one of the best makers of paper mache frames for miniatures and small pictures. The company flourished from 1812 to 1835. Hill made the papier mache frames used in John Miers’ studio during the Regency era. Frames produced by William Hill are rare and sought after by collectors. Measuring: Frame width 5 1/8 inch (13 cm) by height 6 1/8 inch (15.5 cm). Aperture width 2.75 inch (7 cm) by height 3.25 inch (8 cm). Condition: Good with minor undulation to the card. This is a wonderful portrait miniature that dates to the early 19th century. Please see our collection of 18th and 19th century portrait miniatures and silhouettes listed separately in our store as we have a passion for them.